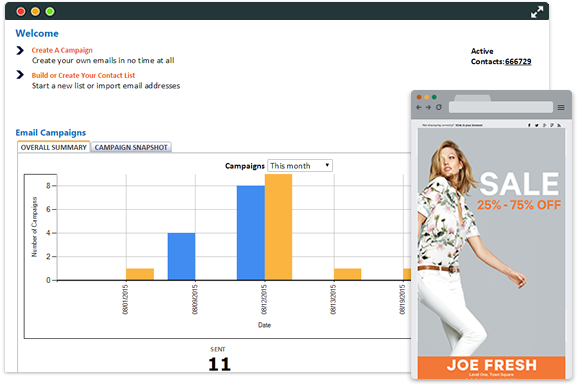 Reson8Direct is an Email Campaign Management System is a web based application with an easy-to-use interface for managing your email groups, creating email templates, creating email campaigns, scheduling and reviewing broadcast campaigns. Individual Contacts - Use Reson8Direct's Contact Management tool to create and manage unlimited number of email contacts along with deep customer profiles. Use the search tools to quickly locate and update information stored for a contact. Custom fields are provided to store additional information not part of the standard field set. Change the status of contacts from ACTIVE to INACTIVE to DO NOT MAIL based on recipient preferences and opt-in status. Contact Groups - Campaigns can be sent to contacts in grouped lists. Each contact may be profiled and added to multiple lists. Lists may be edited or archived when necessary. Lists may be exported to excel for update or reporting requirements. Add/Import - Reson8Direct allows to create contacts using a simple web interface or through import process from Excel files. When importing contacts are automatically updated if matched with new data from the import sheet. New contacts are added along with associated field data. Campaign Creation - Single click access to campaign creation is available directly from the dashboard to allow users to quickly create campaigns using built-in templates. When creating campaigns, users may enable of disable addition of footers to the campaign and even change the footer and sender email to be used for the communication. Reson8Direct includes a SPAM scoring module to evaluate the campaign for its possibility of being identified as SPAM. Users are directed to remove any content or reformat the content to reduce the filtering of the campaign by SPAM filters. Flexible Content Creation - Users can add their own text and images. Using the built-in WSYIWYG editor, text styles, alignment, formatting as well as a append hyperlinks and alt tags to images can be edited. Images can be aligned or resized as needed to fit the content and layout. Mail-merge fields are available for quickly personalizing communication to all recipients. Hands-free Broadcasting - Campaigns may be sent immediately or setup for scheduled delivery at a later time and date. Campaign status is updated in real-time and once broadcast is complete, users can review and measure results of the campaign via reports. Reports - Reson8Direct provides detailed reports to analyze the success of the campaign. Each campaign can be drilled down on for number of sent, bounced, opens, and forwards. Details on the reasons for bounced emails can also be determined to better manage the contact groups and lists. All reports can be exported to Excel or even automatically emailed to designated members. Exported data can be used in reports or for further analysis. Reports are part of each module and are unique to the module. Reson8Direct is backed up back strong customer support and services from Unique Computer Systems. Our team can assist with managing contact lists, designing templates, creating campaigns, managing email campaigns and generating reports for you. Reson8Direct is a professional email campaign management system for direct one-to-one marketing. It is flexible and can be easily customised to suit your requirements.